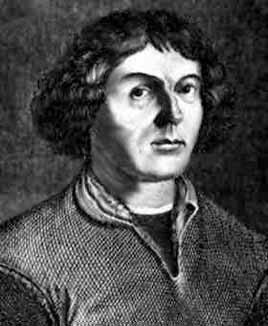 Nicolas Copernicus was born in Poland in 1473. through the influence of his uncle, he was later appointed as a canon in the cathedral of Frauenburg. Through this and while continuing studying, he moved in the highest circles of power. He began to focus on astronomy alone and quietly from a lookout tower located on the protective wall around the cathedral. All his observations were preformed without a telescope which was not invented intil the late 1500´s. In 1530, after 30 years of perfecting and rewriting, Copernicus published his De Revolutionibus. This included his much advanced threory that the Earth rotated on its axis once daily while rotating around the sun once yearly. (Note: Aristarchus, an ancient Greek astronomer, had ideas similar to those of Copernicus but his ideas were rejected in favor of the geocentric belief first proposed by Pythagoras and Aristotle. Until then, the western world believed in the Ptolemiac theory which appealed much more to man´s simple observations and ego. It said that the universe was a closed space beyond which there was nothing and that the Earth, a fixed, immovable mass, was located in the center of that universe, and all celectial bodies including the sun, moon, and stars, moved around it. was just a part of nature and not superior to it. Copernicus died in 1543 without knowing the extent of his influence and improtance. Two Italian scientists of his time, Galileo and Bruno (whose theories went beyond Copernicus') embraced Copernicus´s threories and greatly suffered consequences from the church.